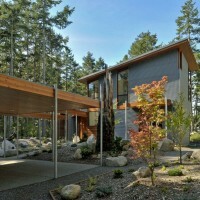 David Vandervort Architects have designed the Lopez Island Residence in Washington State. 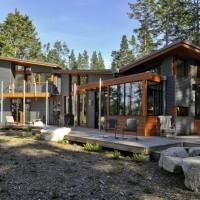 This 1800 sf home is located on a heavily wooded, medium-bank waterfront property on Lopez Island, Washington. 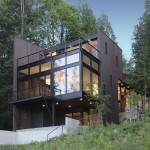 The house is carefully sited amidst the existing trees and the existing land form which slopes up to the bank and view. 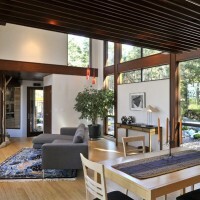 Connections to the outdoors and other features of the property informed the arrangement of space and form. 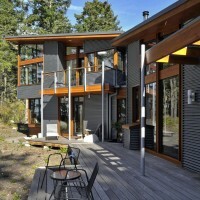 The angle of the living wing corresponds to the bank and creates an embraced outdoor deck area. 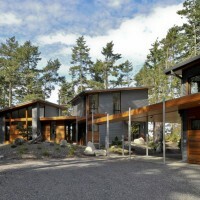 The house reaches out to the southeast path to the beach, to the gardens further to the east and most importantly to the west and northwest views of the water. 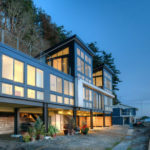 The structure comprises the main house with an isolated upper level master and the studio which houses his and hers art spaces. 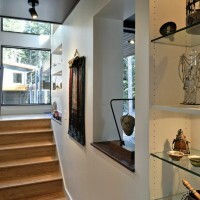 The studio is connected to the house via an arcade which also serves as the main approach to the house. There are Asian influences to the house, particularly in the entry process – including a Tibetan prayer wheel in a special niche. 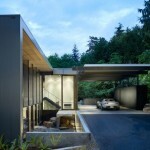 The house forms are simple, derived from the site relationships and the desire to maximize daylight. 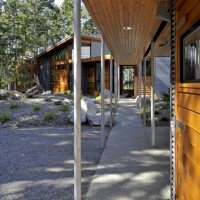 The materials are honest and enlivening – hard vs. soft, warm vs. cool. 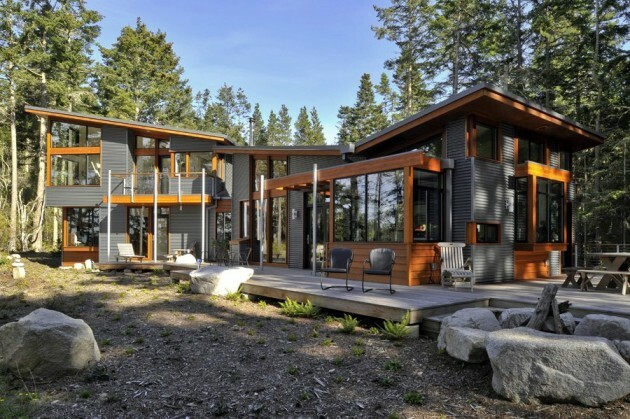 It is a home designed for modern island living. 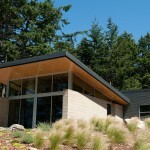 Visit the website of David Vandervort Architects – here.